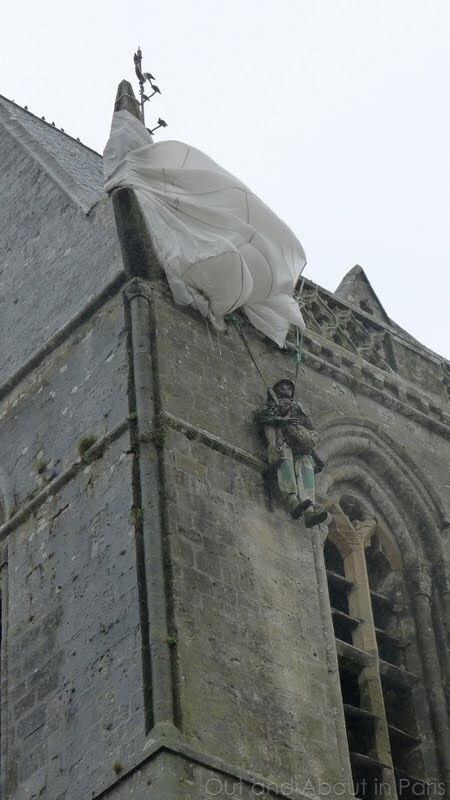 Sainte-Mère-Église - What's a paratrooper doing on the church spire? Just in case you're wondering if I'm mired down in the mud in Normandy, I promise that I'll have a "tasty" post for you on Friday...from Paris! But in the meantime, I would like to tell you a little bit about the paratroopers who contributed to the success of the Allied Invasion. When we pulled into the parking lot in the village of Sainte-Mère-Église, I noticed what appeared to be a large piece of white plastic flapping in the breeze on the church spire. 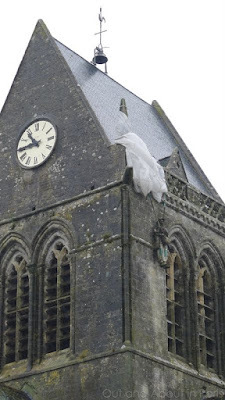 Hmm, I thought to myself, "That must have been a pretty strong gust of wind to have blown that big plastic bag up there!" But when we got out of the car, I saw that it was actually a parachute with a dummy paratrooper dangling from the spire. 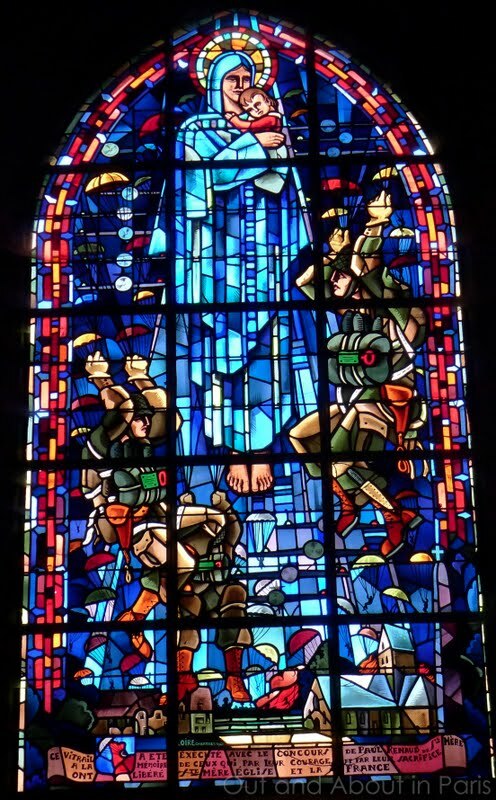 As we huddled under our umbrellas, our guide told us the captivating story of paratrooper John Steele of the 505th Parachute Infantry Regiment, whose parachute was caught on the church spire early in the morning of June 6, 1944 when the paratroopers were erroneously dropped over Sainte-Mère-Église. While some had the misfortune to have their parachutes tangled in trees or caught by buildings, Steele spent two hours pretending to be dead so that the Germans wouldn't shoot him. He was cut down and captured by the Germans but ultimately managed to escape and rejoin his comrades. You may remember seeing Red Button's portrayal of Steele in The Longest Day. The 13,000 American paratroopers dropped on D-Day suffered 10% casualties. Many of the paratroopers, who were wearing about 70 pounds (32 kg) of equipment in addition to their parachutes, drowned when they landed in fields that had been flooded by the Germans. And contrary to what you may think after seeing the photos at the beginning of this post, the paratroopers' chutes were actually dark green for the D-Day Invasion. 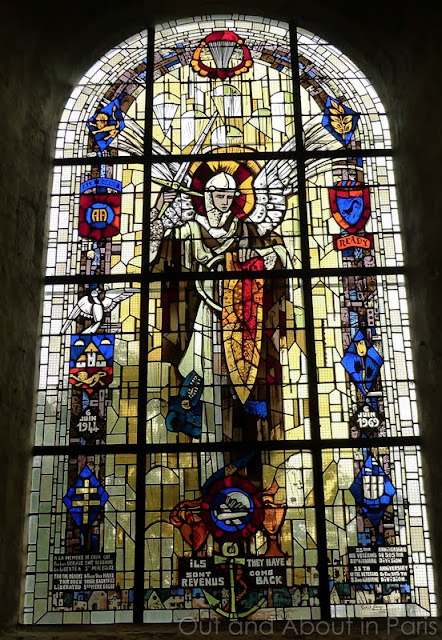 Stained glass window given to the church by the veterans of the 505th Parachute Infantry Regiment of the 82nd Airborne Division to commemorate the 25th anniversary of D-Day. Saint Michael is the patron saint of paratroopers. 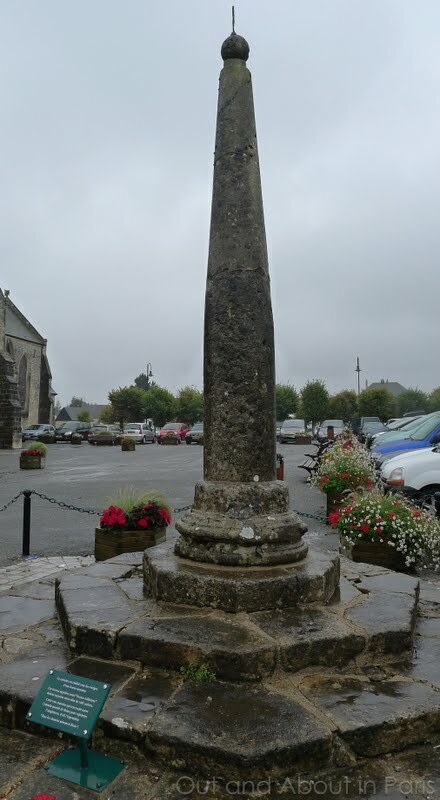 This ancient Roman marker in Sainte-Mere-Eglise has absolutely nothing to do with D-Day. It was used to mark every 1,481 meters of the road from England to Rome. For as the saying goes, "All roads lead to Rome."